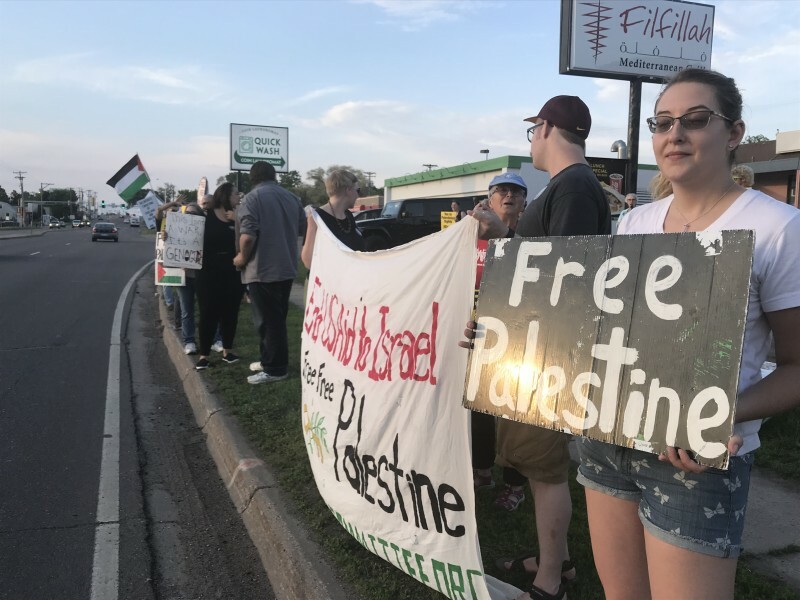 MN protests U.S. support for Israeli massacres | Fight Back! Columbia Heights, MN - On May 23, 45 people gathered with banners and signs at the intersection of 43rd and Central in Columbia Heights to show solidarity with Gaza. Hundreds of cars honked their support as they drove by. The Palestinian Health Ministry in Gaza reports that Israeli soldiers have killed 112 Palestinians, and injured 13,190 since the Great Return March protests started on March 30, Palestinian Land Day. Shauna Armstrong stated that this was her first Palestine protest. She said, "I’m part Native American so I kind understand their point of view. I came because I was just interested in participating to learn more about Palestine."